High Brightness and High Contrast The image quality of these projectors does not disappoint. Up to 3500 lumens mean bright, clear images with the lights on and the 17000:1 contrast ratio adds sharpness with darker blacks and whiter whites. Preset modes give you the best image quality on a beige wall, whiteboard, blackboard or other surface. 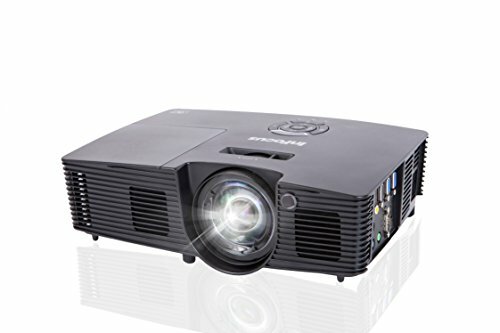 The IN112v supports multiple forms of 3D - including HDMI, Blu-Ray, 3D broadcasting, video games and PC connectivity. All your audience needs are 144Hz DLP Link 3D glasses (not included) to seamlessly synchronize with the image for an awesome 3D experience.. Instantly dim the screen to divert your audience's attention onto you with the Eco Blanking feature on the remote control. Activate when the projector isn't being used and lower the lamp's power usage down to 30%. This saves energy and significantly extends the life of the lamp, which saves you money. Our customers benefit from an affordable price, lamps that can last up to an amazing 10,000 hours, and no filters to replace. A longer life and default-free performance keeps operating costs down.